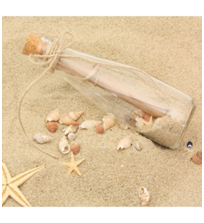 A Message in a Bottle is a form of communication whereby a message is sealed in a container (archetypically a glass bottle, but could be any medium, as long as it floats and remains waterproof) and released into the sea or ocean. Among other purposes they are used for scientific studies of ocean currents. Ever since humans have had the "vessel" for a letter, the ability to write and the time to do it messages have been dropped into the sea. Messages inside of bottles have been floated over a long period of time by a variety of people, for a variety of reasons. The earliest known sender recorded was the Greek philosopher Theophrastus who, in around 310 B.C., threw sealed bottles into the Mediterranean to prove that the inland body of water was formed by the inflow of the Atlantic. On his return to Spain following his first voyage to the New World, Christopher Columbus's ship entered a severe storm. Columbus threw a report of his discovery along with a note asking it to be passed on to the Queen of Spain, in a sealed cask into the sea, hoping the news would make it back even if he did not survive. In fact, Columbus survived and the sealed report was never found, or at least, its discovery never reported. Queen Elizabeth I of England in the 16th Century used bottles to carry intelligence reports. Messages in bottles have been chronicled for centuries and include some of the most famous names in history. For example, Ben Franklin, used message-carrying bottles to compile a basic knowledge of East Coast currents in the mid-1700's, and to this day is still used by the U.S. Navy. According to Guinness World Records, the oldest message in a bottle spent 92 years 229 days at sea. A bottom drift bottle, numbered 423B, was released at 60° 50'N 00° 38'W (about halfway between Aberdeen, Scotland and the coast of Denmark) on April 25, 1914 and recovered by fisherman Mark Anderson of Bixter, Shetland, UK, on December 10, 2006. Today the romantic notion of casting a Message in a Bottle is still alive. Contemporary culture has spawned a popular song by the Police, a book by Nichols Sparks and a companion movie to the best seller. Even Message in a Bottle pre-made kits are now available for purchase. If you are am island castaway, or you just want to enjoy this time honored tradition, using waterproof ink is your best bet for this endeavor. It is a form of ink that can be used in various pens and is intended to not be water-soluble and therefore not run or be ruined by exposure to water. Pen Boutique carries a wide variety of waterproof ink to be used in your own Message in a Bottle! Question: What is the most popular waterproof ink?